The Dell SonicPoint ACi offers secure, high-performance 802.11ac wireless LAN (WLAN) connectivity across the 5 GHz band with enhanced signal quality and range, simplified deployment, and ease of management. Superior wireless performance and range. With support for the 802.11ac standard, the SonicPoint ACi can achieve a data rate of up to 1.3 Gbps while maintaining a higher performance level at greater ranges. Enhanced signal quality and reliability. The 802.11ac wireless standard operates in the 5 GHz frequency band, which is less prone to signal interference, thus enhancing signal quality. Dual radios, internal antennas and 3×3 MIMO result in more reliable wireless coverage. SonicPoint ACi can receive power from Ethernet and Gigabit Ethernet (GbE) cabling through an 802.3at Power over Ethernet (PoE) injector. As a plenum rated access point, the SonicPoint ACi can be safely installed in air-handling spaces, such as in or above suspended ceilings. With internal antennas and dimmable LEDs (excluding power), SonicPoint ACi fits seamlessly into environments that need discreet wireless coverage. The Dell SonicPoint Series includes essential deployment, security and management capabilities that enable any organization to add high-speed wireless into a new or existing network. 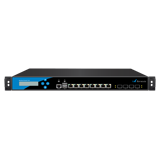 SonicPoint Series access points integrate tightly with Dell SonicWALL next-generation firewalls. Using Reassembly-Free Deep Packet Inspection (RFDPI) technology, these firewalls scan all inbound and outbound traffic on wired and wireless networks and eliminate malware and intrusions. This integration creates a secure wireless solution that delivers comprehensive protection. SonicPoints are automatically detected, provisioned and updated by the managing Dell SonicWALL SuperMassive, NSA or TZ Series firewall, and central WLAN administration is also handled directly from the firewall GUI. Virtual access point (VAP) segmentation. The SonicPoint Series supports dedicated authentication and privacy settings by enabling the creation of up to eight service set identifiers (SSIDs), all sharing the same physical infrastructure. This provides logical segmentation of secure wireless network traffic from guest access. Broad standards and protocols support. 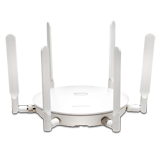 With support for a wide range of wireless standards and security protocols (including 802.11 a/b/g/n/ac, WPA2 and WPA), the SonicPoint Series enables organizations to leverage prior investments in devices that are incapable of supporting higher encryption standards while easing migration to 802.11ac. Wireless intrusion detection and prevention. Wireless intrusion detection and prevention scans the wireless network for unauthorized (rogue) access points and then the managing firewall automatically takes countermeasures to prevent connections to the device. The wireless guest services feature enables administrators to provide internet-only wireless access for guest users. This access is separate from internal access and requires guest users to securely authenticate before access is granted. Extending the Dell SonicWALL wireless guest services model of differentiated internet access for guest users, lightweight hotspot messaging enables extensive customization of the authentication interface and the use of any kind of authentication scheme. Administrators can implement firewall rules for all wireless traffic and control all wireless client communications to any device on the network. For an added layer of security, they can block communications between wireless devices on the same virtual access point.